This is something every kitchen circa 1800 would have had: a kettle for hot water that would hang in the fireplace. It holds enough water to be useful — 6 quarts — but not so much that an average housewife or maid couldn’t lug it to where it was needed. 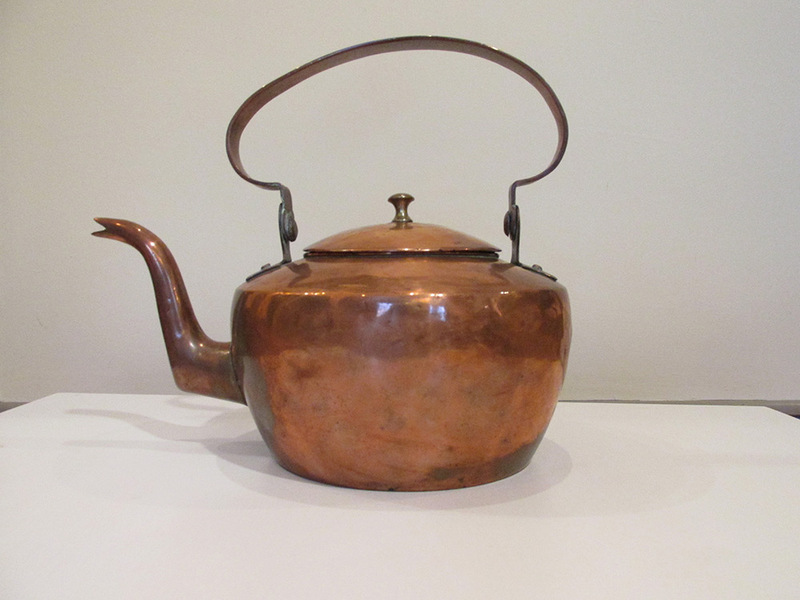 The copper is almost 1/16” thick, much heavier than modern tin ware, able to take knocks and scorching from constant use. Under careful hammering, copper will beautifully flow into a wide variety of shapes, and it readily solders. It likely took around 20 hours for a proficient coppersmith to assemble and raise this from sheet. When it was done and polished, it would have caught the eye of any farmer returning home after selling his livestock in Baltimore, with money in his pocket. It would have cost around $4, at a time when many would work for $.50 a day. Which makes it somewhere around the price of a typical hot water heater today, though prettier. Conrad Schindler was a Shepherdstown coppersmith in the early 1800s. He built a house on the SE Corner of German and Church Streets, where he lived with his family. The Historic Shepherdstown Museum has several pieces of his works.